If you haven’t already read my post about Camryn’s “Big Girl” bedroom decor, then you can view that here. I just wanted to update on the progress of Camryn’s room, and share a few changes that I’ve made to the design board. The most obvious change is the wallpaper. I had originally wanted the Great Meadow Mural wallpaper from Anthro, but after debating over the price, and the size (which wasn’t perfect for the wall I’m wallpapering) I decided to go with something a little different. 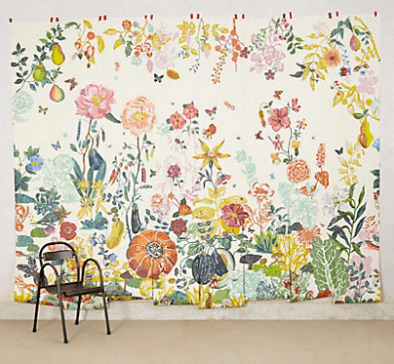 I fell in love with the colors in the Watercolor Peony wallpaper, and it still offers the whimsical and floral look that I want to achieve. The much lower price point has my husband celebrating too. I’ve been dying to get my hands on some of the Caitlin Wilson pillows for awhile now, and they pair perfectly with the color scheme. Have you checked out her new rug line? I nearly scratched the entire mood board for Camryn’s room and started over using one of her rugs as inspiration. They are beautiful! 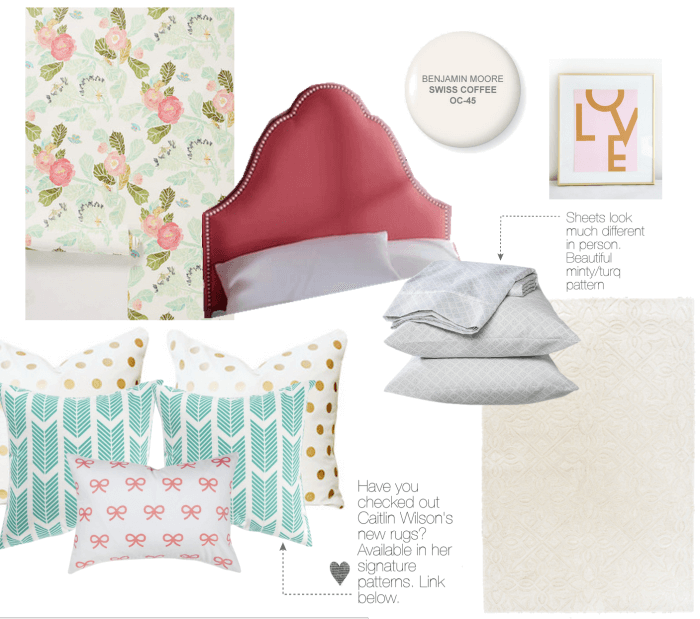 I chose the teal arrows pillows and the coral bows pillow, but may switch up the patterns, we’ll see. I love that she offers multiple patterns in the same shades of colors so you can easily mix and match pillows. Camryn’s headboard arrived last week, and she’s been loving it! I have always called her my “tiny lady”, but she’s been correcting me with “I’m a big lady now mom” ever since the bed switch. She’s so proud of herself. The headboard was extremely easy to assemble (I did it all by myself, so that tells you just how easy), and it’s great quality. It’s a much prettier color in person. I just checked Costco, and it’s no longer available…oh no! Here’s a good dupe. I had planned on buying sheets from Serena & Lily, but snagged these beautiful minty/turquoise sheets at Target, and I’m so happy with them. The colors in person are beautiful, and the pattern is small enough to work well with the pillow fabrics and wallpaper pattern. Did I mention they were only $30? Such a bargain. I also grabbed this organic blanket for the foot of her bed, for cooler nights or to replace her down comforter in the summer heat. The creamy rug is on sale at World Market, and if you use code BIGWIG you can save an additional 10% off. LOVE art is from Made By Girl. I own many of her prints, and they are all favorites of mine. She makes art that pairs really well together, so if you’re in the market for something statement or something to add to a gallery wall, she’s your girl! I’m going to start painting this week, and will instagram progress photos. Her room is a light grey right now, but seems dark and moody because of the poor lighting, so I’m hoping the Swiss Coffee color is a nice bright change. Speaking of bad lighting, any suggestions for fun lighting in her room? I haven’t even begun looking, and would love your input! My husband and I have been talking about moving Camryn into a big girl bed for a few months now, and I think it’s nearly time we actually made the transition. She currently sleeps in her toddler bed and has done great in it. We never have issues with her getting in and out of bed throughout the night, and she’s never fallen out of bed, so I feel safe moving her into something bigger. We have a full size bed for her, but I need to buy a new headboard and change up her room decor. I want to design a space that she can grow into for awhile, and that can have minor changes made without having to overhaul the entire room. To say that I’m in love with this wallpaper would be an understatement. It’s so whimsical, and reminds me of the Secret Garden. It’s the perfect artistic piece for any girls bedroom, and I know my tiny lady would think it’s pretty amazing. I also love having such a big palette of colors to work from, which will make changing small pieces in her room as she gets older really easy. Camryn’s room is currently painted a light grey, which I’ll repaint in Benjamin Moore’s Swiss Coffee. 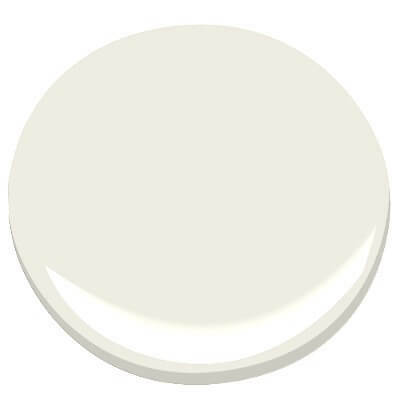 This color is a beautiful creamy off-white, without any yellow tones. The photo does this headboard no justice. Here’s a photo of the headboard in a girls room designed by the uber talented Kristen of 6th Street Design School. There is a large dark wood dresser that I considered painting, but because it’s such an expensive and well made piece, I might leave it. The dark wood might be a nice contrast to the otherwise bright and colorful room. The nightstand needs to take up little space, and not obstruct too much of the beautiful wallpaper…I’ll let you know when I find something. 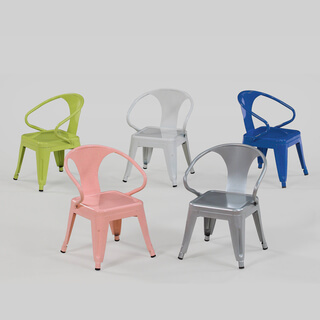 I want to make Camryn a little desk area and I found these darling industrial chairs thanks to Erin of Candy Kirby Designs. They are exactly what I’ve been looking for. Camryn has a huge window seat (with storage – Hooray!) that I want to have a custom cushion made for. I want to pile on a bunch of pretty and comfortable pillows so her and I can lay and read books, watch the sunsets, and look at stars from her window. I’ll keep updating as I make progress on her room over the next few months. If any of you have good decor suggestions like lighting, a nightstand, bedding, etc. then leave me comments below. Tomorrow’s Friday, so go grab yourself a coffee and keep on truckin’, because I can see the light at the end of the tunnel. There’s also a new Camryn Daily photo up if you haven’t seen it already. We had a little rain yesterday, so we threw on our Hunter Wellies and puddle jumped for a bit.